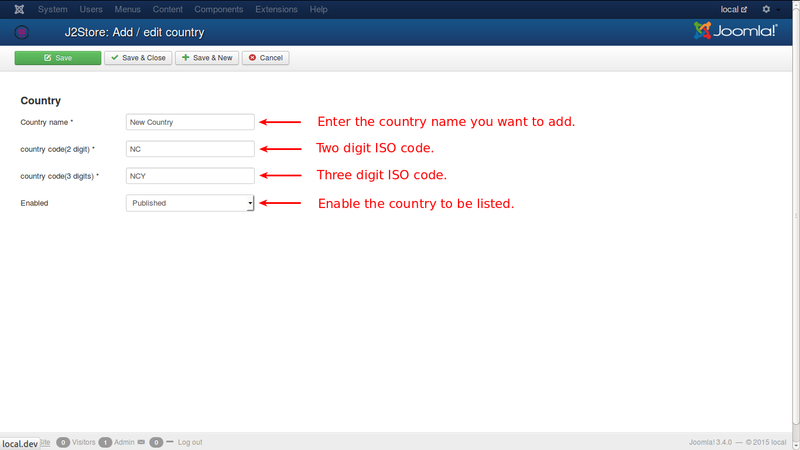 The listing of countries will be like this in your J2Store. Zones are regions that are separated by geographical area for ease of administration purpose, with in a country. Generally, in every country, the state or province, as the case may be, is treated as a zone. Just have look on the image below which displays the list of zones. 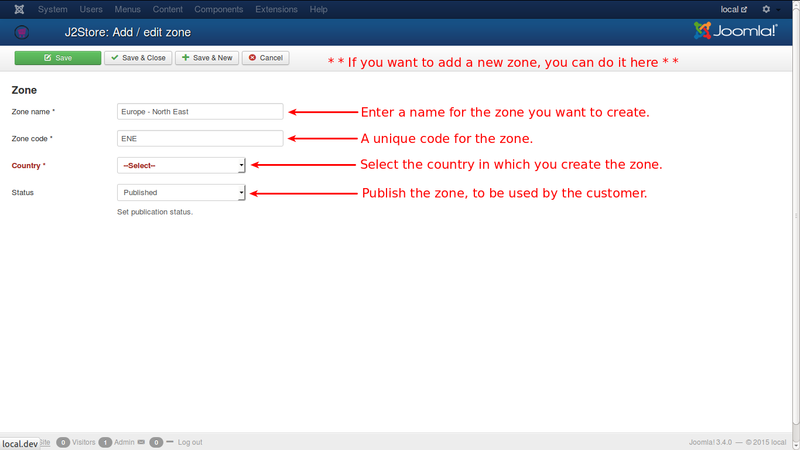 Almost all the zones are loaded by default in J2Store but if you need to create one as and when the situation arises, you can very well do so, as illustrated in the image below. Geozones are created based on geographical locations that have common tax profiles. 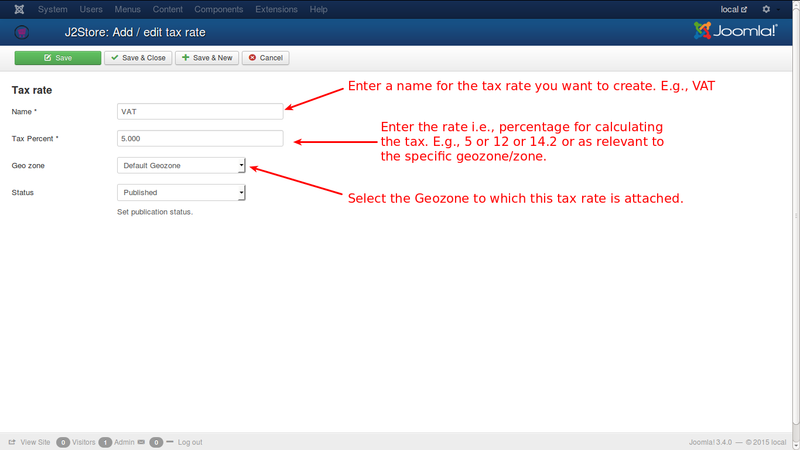 Geozones are used to set up different tax practices for different countries and zones. For instance, if tax percentage for Europe is set at 5% and for US at 10%, then two geozones are created for this purpose and countries belonging to Europe are added in one geozone and US to other geozone. 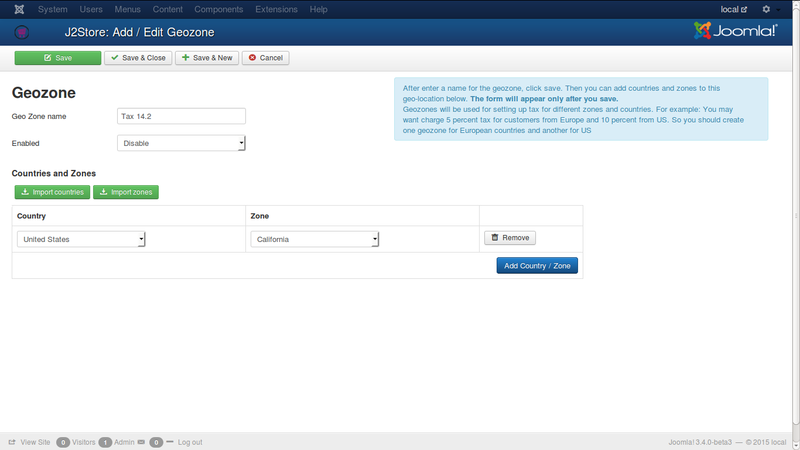 If a geozone is created and saved, then an option row will be displayed to add countries and zones to the new geozone. Like this any number of zones or countries can be added or removed in geozones. One or more tax rates are grouped to form a tax profile.You can map the tax rates to either the customer's billing or shipping address.IMPORTANT: Make sure your taxes are mapped correctly. If you choose Billing here, then in your Configuration - Tax, the Calculate tax based on should also be set to the same address type. Generally, tax is calculated for billing address. But in some countrues, where it is calculated for shipping. Let an example help understand how it works.This example assumes that the store is located in the state of California, US. 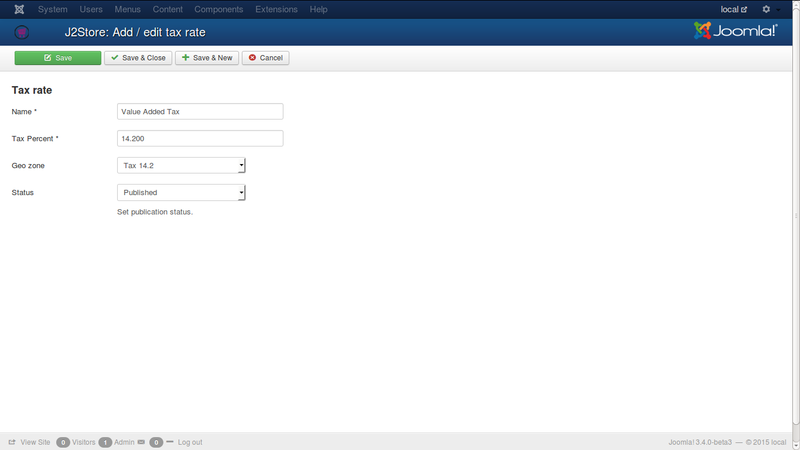 Now create a tax rate in that page by entering the sample data. 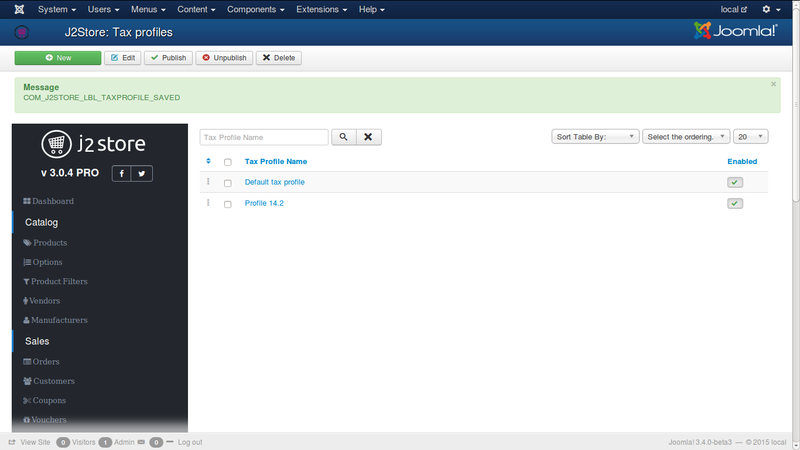 Now go to tax profiles and add a new profile. Now click the green button 'Save' only and no other button. 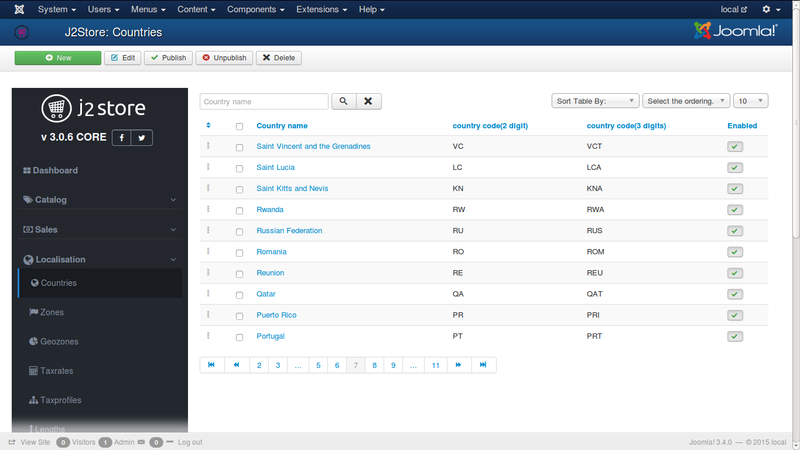 Rate - select the added 'Value Added Tax' from the list. Associated Address - select 'Billing Address' from the list. By default, J2Store adds the most commonly used length measurements. 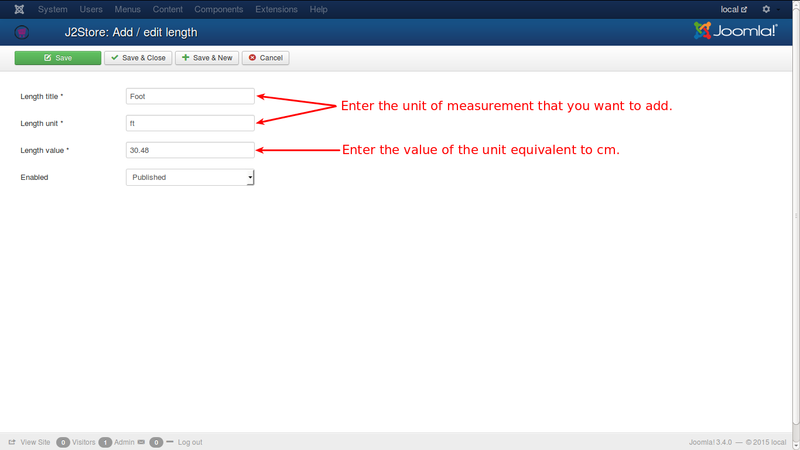 If you require more measurement units, you can add here. This is set to be 1 for default. All other measuring units for base quantity length are relative the given example unit and the value entered for those units must be in correlation to this unit. You can add new units, if you need, as illustrated below. By default, J2Store adds the most commonly used weight measurements. 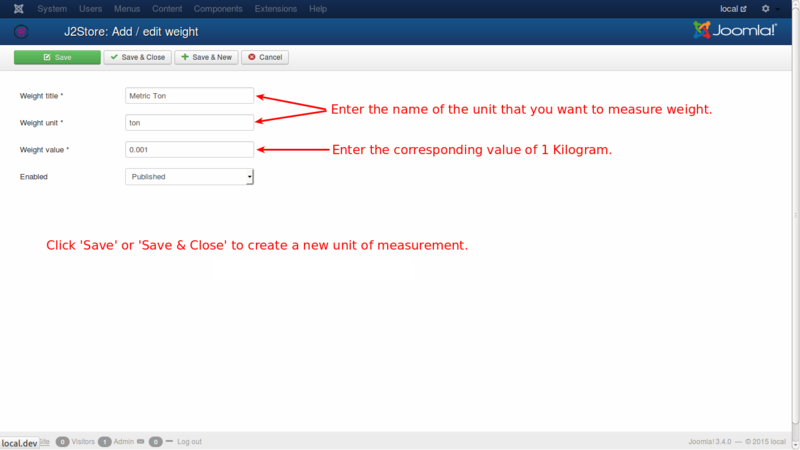 If you require more measurement units, you can add here. The default value for kg is set to be 1. This should be in relativity with other units of measurement. For e.g., there are 1000 grams in 1 Kg, and hence the grams should be set to 1000 when Kg is set to 1. By default, J2Store comes with the following core order statuses. 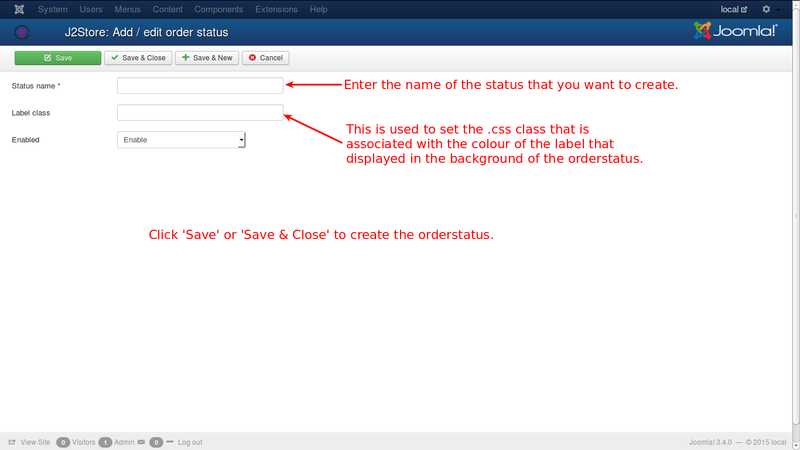 You can add more order statuses if needed.